This post may include affiliate links. Find out more about affiliate links and how they help this site. Today’s spiced pumpkin cake recipe is a long-time favourite, not an easy thing to become given the number of new cake recipes I try out every year. It’s a favourite for good reason, though. Filled with warming and toasty cinnamon, ginger and cloves, this cake is brought to life with a good amount of roasted and pureed pumpkin, which gives it a golden colour and incredibly tender texture. It’s also full of browned butter, in both batter and cream cheese frosting, which made it a winner in my book before I even baked the first batch. I baked this recipe for several years in my regular oven before converting it for combi steam baking, and it’s fantastic either way. The cakes cook a little faster and the crumb is a bit more damp coming out of the steam oven, but I’ve given both conventional and combi steam methods below, so you can choose depending on the appliances you own. I think we’ve established around here that I like to bake (what, you thought the name of this site was an accident? Steam is for steam oven but Bake is ALL about the treats). From brownies to cheesecake, autumnal tarte tatin to completely overloaded caramel-drenched monkey bread, my baking enthusiasm knows almost no bounds. I get especially excited when I find baking recipes and inspiration while travelling, and this particular cake came about when I visited the US in 2010. I’d bought a bunch of food magazines, something I do everywhere I visit because it’s a great way to understand a place’s current thinking on food. The cover of Fine Cooking magazine during that trip boasted a glorious and fall-appropriate brown butter pumpkin layer cake, and I could not wait to get home and try it out. Weeks later, back in my own kitchen with my stack of precious international magazines, I baked the cake – more than once - and absolutely everyone I served it to was thrilled. 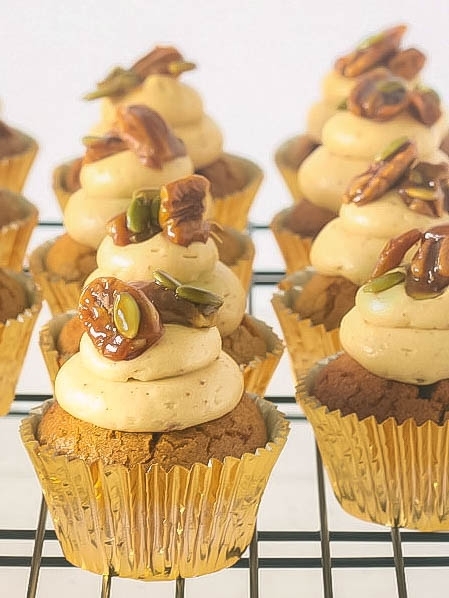 Pumpkin cakes are actually not a big thing in Australia, which might make it more exotic than it would be elsewhere? At any rate, the version I adapted from that first run has continued to be a hit and I’ve baked it at least a couple of times a year ever since, either as a layer cake or cupcakes. Should you use canned pumpkin in your cakes, or make your own? In short, if you have time, make your own. It takes a little forward planning, but it’s cheap, not at all difficult and you can easily double the quantity and freeze enough for another batch of cakes later. The original recipe calls for Sugar Pie pumpkin, but here I use a variety called Kent, which is a very dense-fleshed pumpkin that cooks to a lovely soft texture without too many fibrous bits. On canned pumpkin: because we don’t tend to bake a lot of dishes which call for pumpkin puree in Australia, the canned stuff is hard to come by. I did find a couple of cans a while back, though, and used them to make this recipe. I found something probably unsurprising, which those of you in the US might know already: canned pumpkin, at least the brand I used (which I can no longer see online), doesn’t have a lot of flavour. I will never judge you for taking the canned shortcut, but you’ll find that this cake baked with your own puree is earthier, sweeter and just deeper in flavour than the alternative. If you do use canned, take heart from the fact that possibly no-one except you and I will know the difference. Happy baking, see you here again soon. Adapted from the Brown Butter Pumpkin Layer Cake in Fine Cooking, Fall 2010, Issue 107. Makes 18-20 cupcakes, or 2-3 x 20cm (8 inch) layers. I have written the recipe below with cupcake temperature and timing, but it bakes up beautifully in two or three layers if you’d prefer a single large cake. Just drop the oven temperature about 10 degrees celsius (50 degrees fahrenheit) and adjust the timing if necessary, depending on the size and depth of your layers. When the cakes test clean with a skewer in the centre, they’re done. If you go with a layer cake, I’d recommend making one and a half times, or even a double quantity of the frosting, so you’ve got enough for generous coverage. The remaining 110g (a smidge less than 4oz) brown butter from the cake recipe, set but not cold. If you have a bit either side, don’t worry. The water in the butter cooks out during the browning process, and water content varies from brand to brand so it might be a little different from mine. 1. At least a couple of hours or up to a couple of days ahead, roast and puree the pumpkin. Preheat your oven to 190⁰C/375⁰F. 2. Put the pumpkin into a solid baking tray and roast it for about 30-35 minutes, or until very soft and starting to brown on the edges. Let it cool slightly, then scrape the flesh off the skin (discard the skin), and puree in a food processor or blender. Set aside until cool. You’ll need 1 ½ cups in total. If you have a little leftover you can freeze it for next time or use it for something else (I quite like leftovers stirred through hot pasta with ricotta, peas and bacon for a quick dinner). 3. When you want to make the cake, put the butter in a pan over medium-high heat. Let it melt, then cook, stirring or swirling the pan frequently, until the milk solids start to turn a medium golden brown colour (this takes 5-7 minutes for me but will depend on how hot your pan is). When it’s done, your kitchen will start to smell like buttery roasted nuts. Tip it out of the hot pan into a heatproof bowl quick smart, or it’ll keep cooking. Black butter is not good for much. Let it cool while you get the rest of the ingredients ready. 4. Set your oven to 170⁰C/340⁰F. Line a 12-hole regular sized muffin pan with paper or foil cases (these are the ones from the photos) You’ll turn out and re-use the pan later to make the remaining cakes. 5. In a large bowl, mix the flour, baking soda, spices and salt together, then make a well in the centre. 6. Measure 170g (6 oz) of your brown butter into a mixing jug or bowl (stir it up just before you measure it out as the solids will have sunk during cooling). Set the rest of the butter aside for the frosting. Add the cooled pumpkin, sugars, eggs and milk and whisk well to combine. Pour this mixture into the flour and stir to mix everything together. 7. Divide your batter into the cases (if, like me, you’re pedantic about these things, you could set your tray atop your scales and put exactly 70g into each case. Or just be a normal person and guess it). Bake until the cakes are risen, golden and spring back when gently pressed with a fingertip, about 18-20 minutes. Remove from the oven, let them sit in the tin for a couple of minutes, turn out and repeat the process with the remaining batter. Let the cakes cool completely before frosting. 1. At least a couple of hours or up to a couple of days ahead, roast and puree the pumpkin. Preheat your oven to 200⁰C/400⁰F (combination steam setting). If your oven has variable steam settings, use 80% (if not, don’t worry! Just set the combi steam function and the oven will take care of the humidity percentage). 2. Put the pumpkin into a solid baking tray and roast it for about 20 minutes, or until very soft and starting to brown on the edges. Let it cool slightly, then scrape the flesh off the skin (discard the skin), and puree in a food processor or blender. Set aside until cool. You’ll need 1 ½ cups in total, if you have a little leftover you can freeze it for next time or use it for something else (I quite like leftovers stirred through hot pasta with ricotta, peas and bacon for a quick dinner). 3. When you want to make the cake, put the butter in a pan over medium-high heat. Let it melt, then cook, stirring or swirling the pan frequently, until the milk solids start to turn a golden brown colour (this takes 5-7 minutes for me but will depend on how hot your pan is). When it’s done, your kitchen will start to smell like buttery roasted nuts. Tip it out of the hot pan into a heatproof bowl quick smart, or it’ll keep cooking. Black butter is not good for much. Let it cool while you get the rest of the ingredients ready. 4. Set your oven to 180⁰C/350⁰F (combination steam setting). If your oven has variable steam settings, use 60%. Line a 12-hole regular sized muffin pan with paper or foil cases (these are the ones from the photos). You’ll turn out and re-use the pan later to make the remaining cakes. 7. Divide your batter into the cases (if, like me, you’re pedantic about these things, you could set your tray atop your scales and put exactly 70g into each case. Or just be a normal person and guess it). Bake until the cakes are risen, golden and spring back when pressed with a fingertip, around 12 minutes. Remove from the oven, let them sit in the tin for a couple of minutes, turn out and repeat the process with the remaining batter. Let the cakes cool completely before frosting. 1. Line a large sheet pan with non-stick baking paper. Put the sugar into a pan over high heat. Melt the sugar, swirling the pan occasionally (don’t stir it!) and let it caramelise to a golden amber colour. Remove from heat and immediately add the nuts, seeds, salt and butter. Stir so the butter melts and everything is incorporated. Working quickly, spread the mixture out on the tray and use a silicone spoon to separate as many of the big clumps as you can before the toffee sets. If you aren’t fast enough and a few clumps set, don’t worry as you can break them up later. When cold and set, break up remaining larger pieces and top the frosted cupcakes. I’d recommend doing this right before serving so the toffee stays crunchy. This topping will keep, in an airtight container, for a few days. The more humidity it’s exposed to, the faster the toffee will turn soft. 1. Put the frosting ingredients in the bowl of a stand mixer fitted with the paddle blade. I use my KitchenAid, and if you own one but haven’t come across these amazing scraper blades yet, go and buy one right now. It will change your baking forever. 2. Mix on low speed until creamy, then spread frosting onto the cooled cakes with a palette knife or put into a large piping bag with a plain round nozzle and squeeze a dollop onto each cake. The piping bag is my preferred method because it’s quick. If you aren’t the neatest at piping but still want to give it a go don’t worry, as any unevenness can be hidden underneath the nut topping! Would you like more Steam and Bake recipes and cooking inspiration? Join the mailing list – there’s no spam, just an email every now and then to tell you the latest. Are you new to this site and have no idea what a steam oven even is?! Find out more about my favourite appliance.